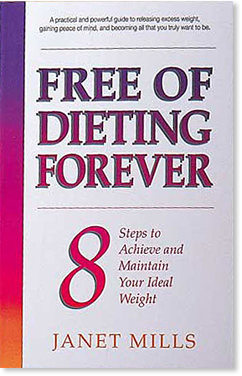 Free of Dieting Forever is about having, gaining, and accepting what you want from life instead of losing, giving up, or getting rid of what you don’t want. It is not about dieting, exercise plans, or rigid weight loss programs of any sort. You won’t be asked to take pills or vitamins, eat certain foods and give up others, weigh your food, or even weigh yourself. You’ll learn why these actions don’t work and what to do instead. What you are about to learn is a philosophy toward life, toward your self and your body. It is a permanent approach toward weight loss that considers the condition of your mind and emotions as well as your body. It touches upon the more complete picture of who you are, why you are this way and what you can do about it. It is not about dieting, exercise plans or rigid weight loss programs of any sort. You won’t be asked to take pills or vitamins, eat certain foods and give up others, weigh your food, or even weigh yourself. Actually, this approach to weight loss is the opposite of dieting in many ways. You don’t have to give up anything, resist your favorite foods or control your behavior through avoidance tactics. You will learn why these actions don’t work and what to do instead. To be free of dieting forever is to find a way of looking at yourself and your body from a new perspective. It is about having, gaining, and accepting what you want from life instead of losing, giving up, or getting rid of what you don’t want. More importantly, it is a process of healing and inner change that comes about through the discovery and release of your inner power and potential. The 8 Steps are powerful principles that will help you to focus and direct the powers of your mind, emotions, and body toward constructive change that will bring you what you want. As you apply these principles, nothing can stop you from achieving and maintaining your ideal weight, or from having almost anything and everything your heart desires. WHAT MUST YOU DO TO ACHIEVE YOUR IDEAL WEIGHT? In order to lose your excess weight forever, you must be willing to gain new ideas and insight about yourself and your body. For instance, you may think of your problem as a need to lose weight and focus on the discrepancy between the way you look now and the way you want to look. Yet the challenge you truly need to address is the difference between who you are now and who you want to become. It may sound trivial, but the difference in how you perceive your problem is important. Deciding to change who you are includes your inner thoughts and feelings, while what you look like or losing weight merely focuses your attention on the outer effect of your thoughts and feelings. Who you are includes your beliefs about the nature of yourself, your body, and food. Who you are is what you think about, how you feel, and what you do with your mental, emotional, and physical energy every hour, day after day. When your attention is constantly focused on food, fat, and the current shape of your body, it’s easy to forget that the cause of your problem begins with those inner thoughts and images! And it’s the cause, not the effect that must be dealt with. You can achieve your ideal weight. You can have a body that reflects who you want to be just as soon as you are ready and willing to be that person in thought, in feeling, and in action. Again, the change must first take place with who you are on the inside. This means being someone who thinks and feels and acts differently than you presently do. It means letting go of your constant attention to the problem and acting as if you are the person you want to be right now instead of wishing you could be someday. You can become the person you want to be by deciding to focus your attention upon your strengths instead of your weaknesses, upon your objectives instead of the obstacles that stand in your way, upon your own unique attributes of beauty instead of each tiny flaw. Soon these inner changes will be reflected without, in your actions, and in the health and condition of your body. How Do You Apply Your Powerful Constructively? Clarify Your Desire: Where Do You Want To Go?